I LOVE that stamp set! 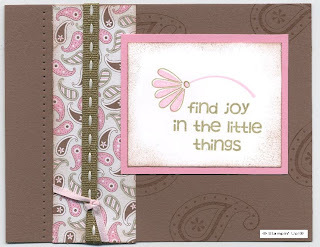 It will be available March 1st in the Spring Mini Catalog- but it is free if you join Stampin' Up! during Sell-a-bration! Stampin' Up! has put together some beautiful Simply Scrappin' kits. Each kit includes exclusive designs and contains 18 sheets of coordinating materials: 8 sheets of 12x12 solid-colored cardstock, 4 sheets of 12x12 patterned cardstock, 6 sheets of 6x12 self-adhesive die cuts. And, of course, everything is acid and lignin free. I had never used them before and was excited when I was able to put together a really cute 6x6 album with just a little effort. Even though the Groundhog says otherwise, our weather feels like winter is going to last 6 more weeks, but not for us stampers! The Winter Mini Catalog and the Sell-a-bration Catalog are ending in less than TWO weeks. If there is anything you just have to have from either catalog, let me know as soon as possible. The last date for orders from the Winter Mini catalog is February 28th, and the last day for Sell-a-bration rewards is February 26th. 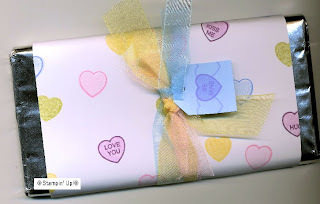 This is a much cuter way to give your sweetie some chocolate! I love making little boxes, baskets, and pouches. It's fun and so much nicer than a store-bought gift bag. I just love this card! I scraplifted the layout from a card I made at a stamp camp a couple of weeks ago, but changed the colors and images. This is a versatile stamp set that can be used for several different occasions and holidays. I love that it's so much more masculine than most of the cards I make. I can't help it - I love purple! If you would like to have a workshop in your home and learn how to make these projects, or ones like them - email me! Sell-a-bration is almost over and I only have a few dates left open this month.